For decades, economists and TV talking heads have studied and debated economic inequality and racial income disparity in America, often attributing the root causes to class, residential segregation, or discrimination to differences in family structure and even genetics. A new extensive study conducted by The Equality of Opportunity Project, analyzed racial differences in economic opportunity using data on 20 million children and their parents across generations, shedding light on a stark reality that African Americans have always known to be true, that race, and racism have always been determining factors in how opportunity is distributed in America. Findings in the study show that black boys, even ones raised in wealthy families, living in the most well-to-do neighborhoods have always earned less than their white counterparts in adulthood. To put it simply, black boys have always had much lower rates of upward mobility than white children, which has contributed to generations of black-white income disparity. whites, blacks, Asians, and American Indians. By analyzing rates of upward and downward mobility, they were able to quantify how incomes change and predict their future earnings trajectories. 1. 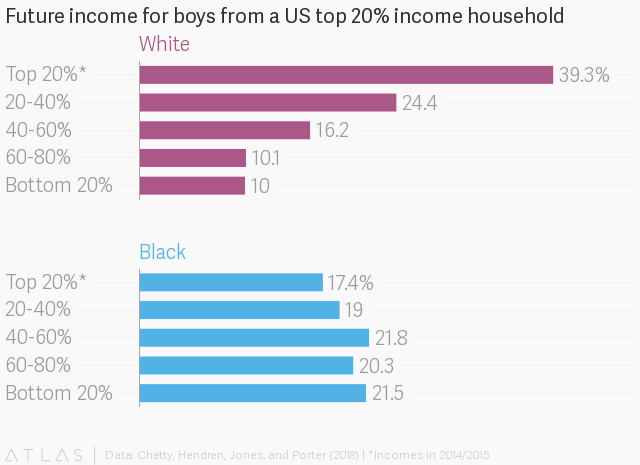 In 99 percent of America’s neighborhoods, black boys still grow up to make less than whites. One of the prominent reasons given for income disparity among blacks and whites is the difference in the neighborhoods they grow up in. The study, however, found that disparities persist even among black and white children who grow up on the same block. Growing up in either Baltimore or Roslyn won’t have any significant impact on the income mobility of black boys as they grow into adulthood, they continue to make less than their white counterparts. “These results reveal that differences in neighborhood-level resources, such as the quality of schools, cannot explain the inter-generational gaps between black and white boys by themselves,” the authors of the study wrote. The results, they said, revealed that differences in neighborhood-level resources, such as the quality of schools, cannot explain the inter-generational gaps between black and white boys by themselves. The researchers even compared data from some of the best metro areas for economic mobility for low-income black boys to ones for low-income white boys. They found that black-white disparities exist in virtually all areas and neighborhoods. 2. The Gap Can Be Closed. One of the findings of the study shows that the black-white income gap isn’t immutable. Black men who move to better areas with low poverty rates, low racial bias, and higher father presence earlier in their childhood have higher incomes and lower rates of incarceration by the time they reach adulthood—demonstrating the effects of growing up in a bad neighborhood. upward mobility, the study found. 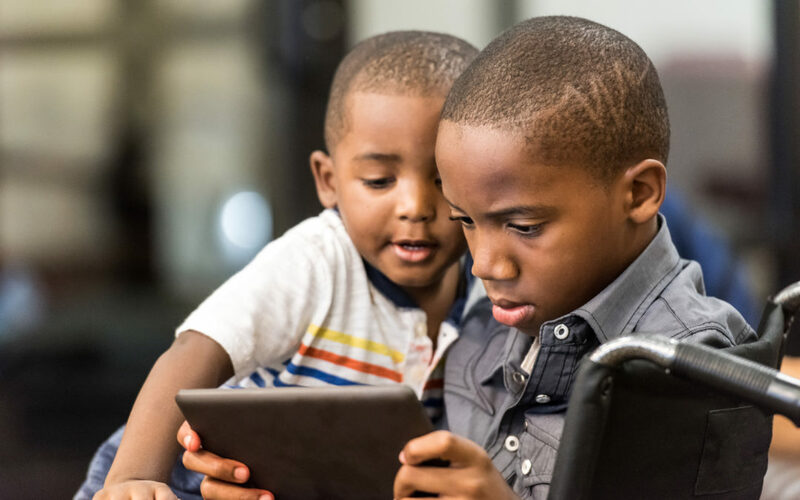 Although black children are much more likely to grow up in single-parent households with less wealth and lower levels of education, those factors do not explain the gap in black-white disparities, the study found. Another hypothesis that is often used to explain racial disparities is that white people are of a higher intelligence than blacks. 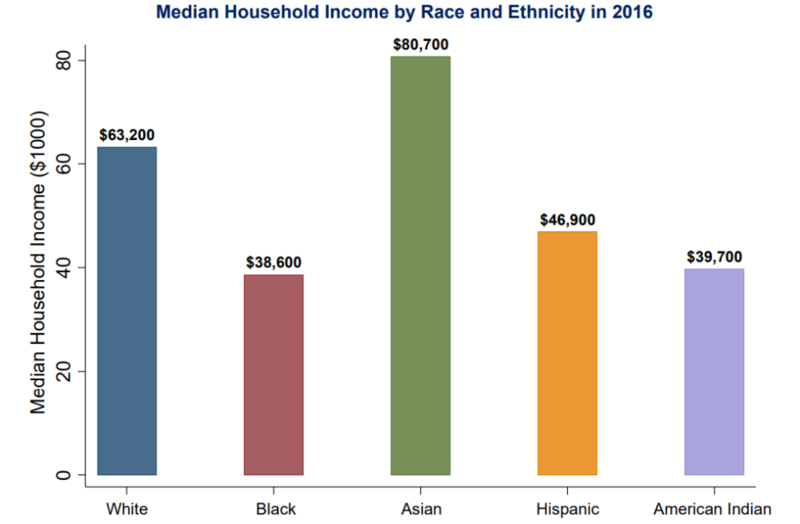 The upward income mobility across generations of Hispanic Americans are slightly below those of whites but well above that of African Americans. They found that blacks and Native Americans have substantially lower rates of upward mobility than the other racial groups. And growing up in a high-income family provides no cushion from these disparities either. The study found that black children with rich parents are almost as likely to fall back into poverty as they are to remain rich. By contrast, white children born to wealthy parents are five times more likely to stay there. Among those who grow up in families with comparable incomes, the study found that there is almost no gap in wage rates or hours of work between black and white women. Conditional on parental income, black women are slightly out-earning white women. Also dependent on parental income, black women’s college attendance rates are higher than white men’s. 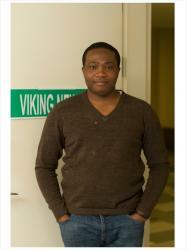 For black men though, the outlook is grim. Among those with comparable incomes, black men grow up to earn significantly less than white men. For black men born to the lowest-income families, 21% of them are incarcerated any given day, which is significantly higher than any other subgroup, the study found.